Food is not the only attraction at Duke’s Seafood & Chowder. John Moscrip, co-owner and COO of Duke’s, understands that and seeks our dynamic and exclusive ways to spice up his beverage program. While 15-25 percent of the dinner menu items sold are limited time offers (which is actually well above national average), the beverage menu is constantly changing and offering new or limited time only cocktails, wines, beers, tasting events and specials to add greater variety. “The recipe that’s worked for Duke’s is gradual change but with enough innovation to stay ahead of the game,” said John Moscrip, when reflecting on the restaurant’s evolution over the last 40+ years. Most significantly, the beverages need to mirror the healthy approach of Duke’s menu items. “One of the most changes (and challenging ones, from a sourcing perspective) was the removal of high fructose corn syrup from everything on the menu – you won’t find Coke or Sprite, or even a standard tonic water here,” he adds. Instead, John sought out Seattle Soda Company to provide HFCS-free ingredients. “We did not take the easy route here and it took us some time to source, find new partners, etc. But, our guests take notice.” He notes that not only are harmful ingredients removed, but the taste is improved. 1977 – The first Duke’s Chowder House opened for business in Queen Anne and became a legendary bar haunt for the who’s who of Seattle throughout the 80s. 1979 – Duke’s served ice cold beer by chilling beers in an aluminum, iced-filled box each night to keep bottles at 33 degrees instead of the 38-48 degrees served at most other bars at that time. 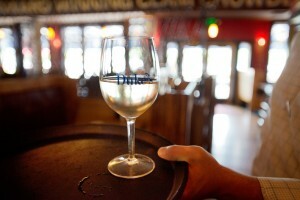 1980 – While other restaurants offered glass pours from Gallo and Cribari, lower-end wineries with a screw-top cap, Duke’s was the first to offer high-end glass pours with a cork finish. Selections included Sorve and Vouvre varietals from Italy and France, Cabernet and Chardonnay from California, and Chateau St. Michelle’s signature Johannesburg Riesling. 1999 – Duke’s began garnishing its Bloody Mary with two Wild Pacific Mexican Prawns, a green olive on a skewer and pickled asparagus long before bacon and cheeseburgers were adorning Bloody Mary cocktails. To this day, its “Bloody Bloody Mary” is the number one best-selling beverage on the menu. 2008 – Duke’s was the first restaurant/bar in the Northwest to go through the Personal Selection program at Woodford Reserve in Versailles, KY and have blended a total of 10 batches of WRPS and 2 WR Double Oaked Single Barrel Selections. 1981 – Kamikaze Cocktails were first invented at Duke’s, incorporating equal parts lime juice, triple sec, and vodka, shaken over ice and served straight up. 2001 – Spirit infusions were created at Duke’s. Classic offerings have always included black pepper/roasted garlic/roasted bell peppers/onions/lemon infused vodka for its “Bloody Bloody Mary” and lime/mint/cucumber infused vodka for its Cucumber Mojito. 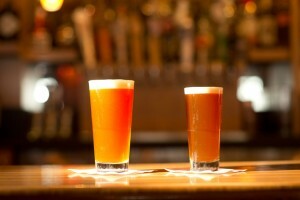 Duke’s focuses on local craft breweries. Dating back to the early 90’s, the restaurant was among the first to incorporate craft brewers into its tap lineup. The restaurant discovered Georgetown’s Manny’s Pale Ale and Mac ‘n Jacks long before they became the highly popular offerings seen at nearly every bar in town. Throughout the company, Duke’s allows each location to select three to six of its own rotating tap handles based on local breweries and customer interest. “At Duke’s, we want to make it as easy as possible for people to experience and enjoy new wines, especially the burgeoning local wine market” said Moscrip. Half price bottles every Monday night, every Duke’s. Duke’s bartending approach is service oriented – 70-80% of the bartenders have worked their way up from serving. Experience is key. It’s all about generous pours, good quality and professional bartenders.